A CSX crude oil train derailed February 16 about 33 miles SE of Charleston, West Virginia, resulting in explosions, fires and crude oil spilling into the adjacent Armstrong Creek and Kanawha River. West Virginia Governor Earl Ray Tomblin declared a state of emergency as 2 towns were evacuated, at least one home was destroyed and at least one person was injured (Reuters, Metro News, Bloomberg). Although there is confusion surrounding the number of cars involved in the derailment, it appears that about 27 tanker cars loaded with very flammable Bakken crude oil derailed, and about 15 of them caught fire, several of them plunging into the Kanawha River. Officials, worried about crude oil contaminating the Montgomery water treatment plant on the Kanawha River, shut down the plant shortly following the derailment and spill. Eyewitnesses said flames shot at least 300 feet into the air, and 9 or 10 tank cars exploded at intervals of about every half hour. Evacuation shelters were set up in Smithers and Montgomery, with the Red Cross and other relief organizations addressing residents’ needs. 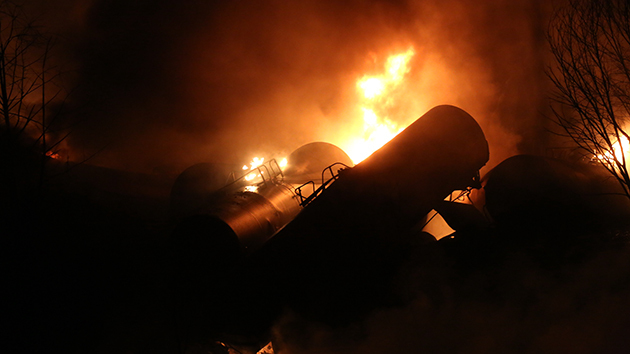 The CSX oil train derailment and fires occurred only 2 days following the derailment near Timmins, Ontario of 29 Canadian National Railway tank cars loaded with crude oil from Alberta’s tar sands region. Seven cars caught fire, and were still burning 2 days following the derailment. See this Railroaded link for more information on the dangers associated with shipping oil and other hazardous goods by rail. ~ by railroaded on February 17, 2015.